KATE SPADE DAYCATION PINK CAMEL PARTY PRINT LARGE COLIN TRAIN CASE COSMETIC CASE SET. This Kate Spade Daycation Pink Camel Party Print Large Colin Train Case Cosmetic Case Set is brand new with tags. Includes: Matching Removable Zipper Pouch. Brand new Kate Spade Cosmetic Case Style # WLR5286. Daycation Large Colin Train Case Cosmetic Case Set with 2 Cosmetic Cases in 2 convenient sizes. There is a Train Case and a Travel Cosmetic Case in each Set. Constructed of a Pink Camel Party Allover Print design on a Lurex Fabric with a clear PVC protective coating and matching leather trim. The interior of each case is lined with a wipeable easy care lining. Each Case has the signature polished 14K Yellow Gold-Dipped Hardware. A Kate Spade signature and logo is embroidered on a cotton twill label on the exterior front. The Train Case is the large Cosmetic Case in this Set. Measures 11 inches wide x 6 inches high x 7 inches deep. 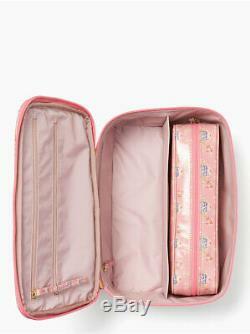 The deep base has dual zippers positioned at the top collar of the Cosmetic Case. The dual zippers open from the center to the back wall hinge. The Top lid has a wide handle with a raised area beneath to accommodate the fingers. The interior of the lid has zipper pockets to secure small items. The large base is divided into 2 large storage areas. An open slip pocket is on the back wall of this Cosmetic Case. 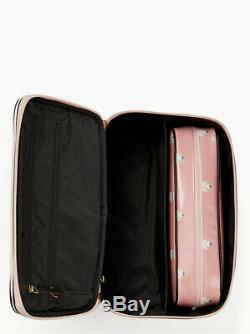 The Travel Cosmetic Case will arrive stored in one of the storage areas. A Removable Zipper Pouch is included. The Travel Cosmetic Case is a Top Zipper with the zipper opening from the midline of the left side to the midline of the right side. This zipper opening style offers a complete view and complete access to the interior of the Case. Measures 11 inches wide x 3.5 inches high x 2.5 inches deep. An open slip pocket is on the interior back wall. This Daycation Large Colin Cosmetic Case Set is a wonderful Set with 2 Cosmetic Cases in 2 convenient sizes. 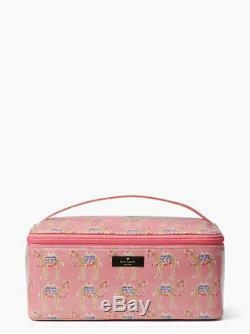 Each Cosmetic Case has a fun Camel Party design in an allover print on a pink background. This'cheeky' and fancy Camel design is a fun way to tell the story of the'strong and worldly Camel' as the very best traveler. The Camels travel together are the fun part of the party print. This Set has 2 attractive Cosmetic Cases in 2 convenient sizes with this fun and fancy design. Both Cases are spacious with storage areas to meet your needs. Each Case has a clear protective coating for easy care and simple maintenance. Has the very best elements from Kate Spade. 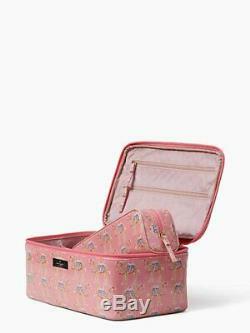 The item "KATE SPADE DAYCATION PINK CAMEL PARTY PRINT COLIN TRAIN CASE COSMETIC CASE SET" is in sale since Sunday, March 24, 2019. This item is in the category "Health & Beauty\Makeup\Makeup Bags & Cases". The seller is "morethan300yards" and is located in Gibsonia, Pennsylvania. This item can be shipped worldwide.